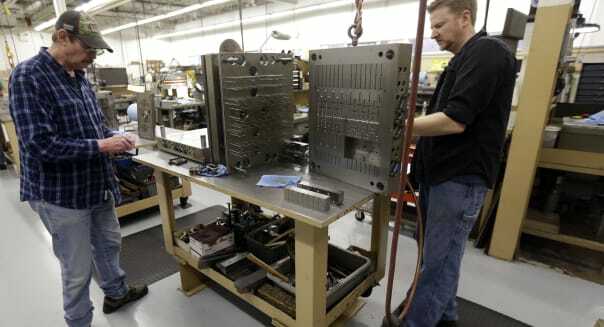 NEW YORK -- Growth in factory activity in the U.S. mid-Atlantic region gained momentum in January but firms' outlook for the months ahead worsened, a regional Federal Reserve gauge released Thursday showed. The Philadelphia Federal Reserve Bank said its business activity index stood at 9.4 points compared with 6.4 in December. January's reading beat the median forecast of 8.6 among economists polled by Reuters. Any reading above zero indicates manufacturing expansion in the region, which includes factories in eastern Pennsylvania, southern New Jersey and Delaware. The index has been positive for eight consecutive months. The employment component jumped to 10.0 from 4.4 and prices paid rose to 18.7 from 16.4. But the forward-looking new orders index slipped to 5.1 from 12.9 in December. Ian Lyngen, a senior government bond strategist at CRT Capital, %VIRTUAL-article-sponsoredlinks%said the report was solid overall but called some of the details "troubling." The six-month business conditions index also fell to 34.4 from December's reading of 44.8. In October, this outlook gauge was 60.8, which was the highest since September 2003. "We've seen a softening of those numbers for the last four or five months, but the readings are still higher than average," said Michael Trebling, senior economic analyst at Philadelphia Fed. "The comments we get still reflect general optimism, though people use terms like 'moderate' or 'tepid' when talking about growth," he said. The survey is one of the first monthly indicators of the health of U.S. manufacturing leading up to the national report by the Institute for Supply Management.